Cornell doesn’t separate life and education. At Cornell living is learning. Learning is a way of life. And life at Cornell is meant to pique your curiosity and stimulate your intellect at every turn. Whether that means conversations with faculty members over dinner at your residence hall or a trip to New York City for underground jazz, the opportunities are yours for the choosing. Ah, the twin cravings of life: the comforts of home and the stimulation of new experiences. Cornell strives to help you strike the right balance—no matter your culture, your food preferences, or your best study environment. They have what you need to nourish the mind and the body. 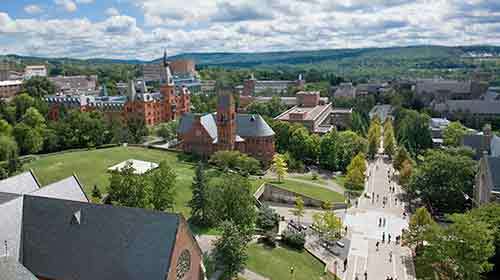 Cornell is a private, Ivy League university and the land-grant university for New York State. Cornell’s mission is to discover, preserve, and disseminate knowledge; produce creative work; and promote a culture of broad inquiry throughout and beyond the Cornell community. Cornell also aims, through public service, to enhance the lives and livelihoods of our students, the people of New York, and others around the world. Dragon Day: Each year in late March, first-year students from the College of Architecture, Art, and Planning (AAP) create and parade an enormous dragon across campus. Accompanied by AAP students in costume and heckled by rivals from the College of Engineering, the dragon lumbers to the Arts Quad to be consumed by a symbolic bonfire. Formalized by AAP students in the 1950s, Dragon Day’s roots are actually traced back to the antics of the architecture Class of 1901. Chimes Concerts: The heartbeat of campus life, the Cornell Chimes have been marking the hours and chiming concerts for more than a century. The original set of bells first rang out at the university’s opening ceremonies October 7, 1868. The chimes continue to ring daily concerts, making it one of the largest and most frequently played set of chimes in the world. Homecoming: Meet current students, alumni, faculty, and staff as you cheer on Cornell in the traditional homecoming football game. Recent homecoming events have included the Big Red Band, a firework and laser show, and a carnival. Slope Day: The ultimate celebration of the last day of classes, Slope Day continues a century-long tradition as a year-end gathering. Live musical performances are the main feature of this Cornell community fete. Cornell Ice Hockey: Big Red ice hockey at Lynah Rink is one of Cornell’s treasured spectator sports. Learn cheers for the Cornell hockey team, or cross off an item on the list of 161 things every Cornellian should do by joining hundreds of others in camping out for season tickets. The “Lynah Faithful”, as they are known, celebrate with the Cowbell cheer. The hardest part about staying active at Cornell is deciding which activities to take part in. From ropes courses to caving and everything in the world between, Cornell Outdoor Education sees 37,000 participant days every year. More interested in swimming or shooting pool, martial arts or massage? We’ve got you covered with more than 100 physical education classes, in addition to four fitness centers, a bowling center, and two recreational centers. Big Red Bear – Cornell has never had an official mascot, but early in the school’s athletic history a bear took over as its most recognizable symbol. The first live Cornell bear mascot appeared in 1915 during Cornell’s undefeated and national championship football season. The current mascot is a Cornell undergraduate who performs at various varsity athletic events, including at all football and men’s ice hockey games. Fourteen colleges and schools-seven undergraduate units and four graduate and professional units in Ithaca, two medical graduate and professional units in New York City, and one in Doha, Qatar-each autonomous in its programs, its admissions, its faculty, and its support. Each working together as Cornell University to serve you, your needs and Cornell’s specific missions. Cornell offers nearly 80 formal major fields as well as challenging dual-degree programs and a score of interdisciplinary majors that cross traditional departmental boundaries. Cornell’s diverse community consists of over 14,300 undergraduates, 5,200 graduate students, 2,300 professional school students, and over 1,600 faculty members. The solution to the Poincaré Conjecture, one of the most famous problems in mathematics, was first posted on Cornell’s arXiv.org. Cornell endowed the nation’s first professorships in American history, musicology, and American literature. Cornell awarded the world’s first degree in journalism, the nation’s first degree in veterinary medicine, and the first doctorates in electrical and industrial engineering. (born March 15, 1933) earned her bachelor’s degree in government from Cornell University in 1954, finishing first in her class. She later graduated from Columbia Law School, going on to become a staunch courtroom advocate for the fair treatment of women and working with the ACLU’s Women’s Rights Project. She was appointed by President Carter to the U.S. Court of Appeals in 1980 and was appointed to the Supreme Court by President Clinton in 1993. (born November 27, 1955) grew up in Washington, D.C. After graduating from Cornell University, he moved to Seattle to work as a mechanical engineer for Boeing, where he developed a hydraulic pressure resonance suppressor that is still used in the Boeing 747, and eventually became a comedy show writer and performer. Nye went on to become the face of Bill Nye the Science Guy, an award-winning educational program that taught science to preteens. Also a successful author, he remains a popular public figure and vocal member of the science community.